On the evening of May 1, 2011, two Black Hawk helicopters loaded with 23 Navy SEALs, a translator, and a dog named Cairo approached a residential compound outside Abbottabad, Pakistan. Minutes later, one of the helicopters landed outside the target property. The other spiraled into the ground in a barely-controlled crash landing. Not exactly according to plan. And yet, a few minutes later, the 12 SEALs in the downed Black Hawk calmly radioed the other group, and they proceeded with the mission. Eighteen minutes later, Osama bin Laden was dead. The 23 SEALs, the translator, and the dog all made it home safely. Given the circumstances, surely this mission constitutes a miracle, right? Over the past nine years, this team of SEALs had successfully completed so many similar operations that nothing shook them. Not even a crashed ‘copter while going after the most wanted man on the planet. I’m in no way comparing what a Navy SEAL deals with to what you deal with as a writer. Writing can be tough, and even scary, but it’s a walk in the park compared to the job performed by any member of the armed services. Want to tackle the most ambitious content projects without fear? Want to crank out magnificent copy each and every time? Want to write brilliantly as a simple matter of routine? Previous article: Would You Trade Boredom for Stress to Have Your Own Business? This post reminds me of one of my favorite sayings…. that courage is not lack of fear, but feeling fear and doing what’s required anyway. My Dad was a WWII veteran with a chest full of medals and he used to tell me that he was scared out of his wits often, but it was never about the fear, it was about what needed to be done. And that does relate to writing, because writers often tackle topics that need to be said. There really are times when the pen is mightier…. (Geez, aren’t I full of cliches today.) Have a great day! “This American Life” told the story about a boy who saved the life of a disabled classmate when they went to a zoo and the snakes got loose. How did he act so calmly while his teachers panicked, and deserted the disabled child? It was because his uncle was the zoo’s snake handler, and taught fearless boy what to do in sticky situations. Sean D’Souza recommends getting writing practice everywhere. Turn that email response into a full blown article. Turn that blog comment into an well thought out, but quickly written article. Then when it comes down to produce content, you’ll have hours of practice, and maybe even a post you can repurpose from your practice writing. Brian, it probably also helped the Seals that no one around panicked. When I hang around other people who are fearless in creating their content and charging people for services, I have a much easier time showing courage myself. Quit whining, and keep [fill in the bank]. Too many bad decisions are made when people panic, both in their personal and business lives. Sometimes it’s better to ride out the storm than abandon ship! Stop whining, keep writing. Love it. It will be my new motto when I’m feeling creativity-challenged. I love what Ira Glass says about this. He calls the creative gap that time when you have great taste, but can’t create to the level of your taste. His advice? Keep going. Do it as often as you can. After awhile it will become “like mowing the lawn”. Again, great advice Brian. The only way to do anything well is to do it so often that it’s second nature. Short and sweet and packs a punch. Nicely done. Well illustrated Clark. As I recall the great victory won by United States over AlQaeda, I’m inspired to persevere in whatever I’m doing. As a visionary writer, my vision is to create quality content that is epic, provocative and income generating. Thank you for sharing this tips, out of your busy schedule. Your post illustrates a key quality of the best and the brightest: Prepare like crazy, then let it rip. Thanks for the encouragement. It’s as if you wrote just for me this morning. Thanks. Love this! The most important key to being a good writer is not planning to do it or wanting to do it. To be a good writer you need to do it a lot, every day. The best trained, most well equipped fighting force in the World took 10 years and spent countless millions to corner and catch just one man – if one is honest its hardly inspirational stuff. In fact if it wasn’t so serious it would be funny. The really inspirational story here is how a tiny, modestly funded group of complete %&*^& lunatics managed to hold out against these insurmountable odds for so long. Just like Vietnam in 30 years time I think we will look back and respect the brilliance and bravery of the enemy, they may be completely crazy but they really believed in their cause. Oh an BTW as someone that has served in this war on terror I have earned the right to my point of view. And I would add — and keep reading! It can really help writers to improve if they’re a dedicated reader, so they can learn from examples of what to do — and what not to do, in some cases. Great post Brian. Training is all over the world. Like Sonia Simone said yesterday, she got to be a good writer by doing it a lot. And let us not forget how much sacrifice was involved, including the lives of many Americans and many others to get to Bin Laden. This mission may have been rote to these solders, but those 15 minutes manifested the huge effort of thousands of people over a decade of time. It’s sort of like how it takes me reading CopyBlogger every single day to get these ideas into my thick skull. But my efforts are like you say, a walk in the park. With a map and a drink. PS, A few days have passed since 9-11, so good timing. We believe in the warrior mindset because we know that results are built on the foundation of great skill. Skill is acquired through time on the task. Only when you combine a clear vision of the outcome with the discipline of practice, is master possible. This is really morivating and patriotic.i would really appreciate your blog.you really inspired me thnx brian thnk u. Excellent advice. Prepare, drill, rehearse, practice, plan for contingencies – then improvise! Blogging/writing rarely causes collateral damage, and the flak is usually from trolls, but the analogy is apt. The key to success in Special Operations was training and planning. The actual mission is the tip of the iceberg. If you accomplish a mission without fear it means you are a sociopath of psychopath. Fear is an integral part of things for everyone else. To be honest I’m not sure how quit whining factors into those three things. I agree about not whining but simply not doing that will bring about the things you say. Feels a bit like The Secret. Think good thoughts and good things will happen. To be honest, it feels a bit like you’re using a trending topic to promote, which I suppose is good marketing. However men died on a subsequent mission. So perhaps, in the shadow of 9-11 we remember them a bit? I see these things with experience both in Special Operations and in writing. Bob, the specific advice is to “keep writing” (training). The “quit whining” part is just a reminder of how lucky we are to spend our time writing instead of fighting in the desert. As for the timing, I wrote this post a month ago, but pulled it back in honor of the SEALS who were killed in Afghanistan. That happened 2 days after I originally wrote this, and I recognized it would be insensitive to publish then. Two days after a terror free 10th anniversary of 9-11, however, feels more like an appropriate tribute. 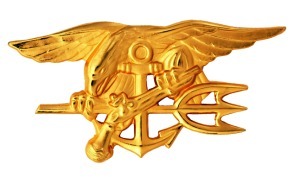 The SEAL’s are a great example of what training, dedication, and a “Never Give Up” attitude can do. Much like the SEAL’s, very few actually actually make the commitment to go beyond the ordinary. This gives the dedicated few the chance for greatness. Keep up the greatness Brian! Damn. I made fun of this post in my head expecting it to be overdramatic. It’s not, and I loved it. Persistent practice slays fears. Fear holds you back from being a successful writer. Fear of criticism. Fear of not having enough time….fear of all types of stuff, preventing you from moving forward. Detailed, step by step addressing of these fears helps dissolve them, but practicing day in and day out helps to obliterate them. The more FAITH you have in your writing ability the more quickly your writing FEARS dissolve. Practicing writing builds writing confidence, which bolsters your faith in self. It’s one of the reasons I write mini-guest post sized comments. I intend to make a positive impression and master my craft, each time I visit a blog. My confidence has skyrocketed due to practicing all day long, leaving comments, and also running 3 blogs, all of which I post on daily. The more you do something, the more routine it becomes, and even when things appear to be falling apart during your execution the countless hours spent practicing helps you handle the situation with ease and confidence. Thanks for sharing your insight Brian! ‘Quit whining and keep writing’? 🙂 We have a similar saying over here at Giglets, I believe Thomas Carlyle said it and we just keep harping back to it whenever we’re down on ourselves or whining like spoiled toddlers: ‘No pressure, no diamonds.’ It could apply to anything but we use it to keep writing when we’re about ready sob and throw books at each other. What an interesting article. Thank you so much for making the comparison – I’m ready to write! I recently read the book, Lone Survivor. It’s the true story of a 4 person Navy Seal team that fought against 100+ al Qaeda soldiers in the hills of Afghanistan. Only one Seal lived to tell the story of the battle. Whenever I’m tired, frustrated and ready to give up on a project, I think about what I read in that book and how those soldiers did not ever quit in the face of insurmountable odds. And it keeps me from quitting. Lone Survivor was one the best books I’ve read in a long time. Absolutely incredible true story (although I hear there are some SEAL inaccuracies). No matter, Marcus Luttrell is an absolute American hero. I do the same thing when I am a bit down and feel like quitting and think if him and the heroes that died that day so Luttrell could tell the story. Never give up and just keep writing! This cool article is reminds us that practice makes perfect. Its like the simple question : How do we become a star in one night ? Work hard 25 years before that night. Brian why don’t you make an article about the disadvantages of ‘delaying’. It said that delaying is the No 1 cause of misfortune, lost of valuable chances, and also slipping away of ideas. We have to do it right away, what ever ideas we have in our mind or else someone will eventually come up with it and benefits. Like delaying an idea to write a great blog post or start a business venture. Just like the new tag line for Johnny Walker right? Keep writing. That’s the spirit!